Home > About > News and Views > How you can be sure your test strips have passed the test? 1. Your FreeStyle Optium blood glucose test strip is really a mini-electrode. The glucose in the blood you put on the strip reacts with an enzyme in the strip, which creates an electrical current, conveyed on a circuit to the meter and turned into the reading you see. Ensuring this process is consistent, accurate and reliable is the main aim when manufacturing test strips. 2. 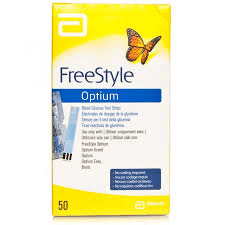 FreeStyle Optium blood glucose and blood ketone test strips are made at Abbott’s manufacturing site in Witney. It took eight years to reach the milestone of annually producing 1 billion test strips on the site. Now, capacity and processes have improved so much, the site makes more than 2 billion strips in a single year – that’s about 12 million every working day. An electronic display in the building’s main corridor keeps track of the number of test strips produced since the year 2000. At the time of writing, it was reading 21,417,063,376 – but this will be way out of date by now! 3. About 4% of strips made in Witney are used in the UK; the rest are exported to 115 countries around the world. In total, about 75% of strips are used at home, and 25% in hospitals. Each year, Abbott uses 10.5 million metres of foil to wrap FreeStyle Optium test strips, and packs them in 36.3 million cardboard cartons. 4. Abbott employs approximately 620 people at its Witney site. Just under half of the staff work on the manufacturing side, while the rest focus on every aspect of perfecting the process, including research and development, statistical analysis, technical support, procurement, and product quality testing. 5. Manufacturing a test strip is a highly sophisticated, precision printing process. Each strip is built up in layers, starting with a polyester base, a carbon layer to improve conductivity, a silver-based printed circuit, a ‘working layer’ that contains the enzyme and a mesh to disperse the blood sample. An insulating layer is then added to protect the circuit and define the sample application area, and finally a tape layer to protect that area and define the required fill volume. 6. The machines used for each stage of the process have been designed and adapted specifically for Abbott’s requirements, in many cases unique. An in-house team works on developing and refining the equipment used to manufacture the strips and also to create tools for testing the products and processes. Every stage of the manufacturing process is tested and inspected. Four vision systems on the production lines, with 7 cameras on each, capture approximately 10 million images every day. A system of bar codes ensures each individual strip is traceable from the beginning to end of its manufacture. 7. The manufacturing area is strictly controlled for humidity and temperature, so the production line environment is kept as consistent as possible. 8. Every tiny detail of production at Witney is continually being monitored and reviewed to see if it can be done more quickly, efficiently or effectively. Staff are trained in Six SigmaTM (a set of techniques and tools developed in the USA to improve processes) and also work to the Japanese concept of Kaizen, which means ‘continuous steady improvement’. 9. One improvement exercise found how a waste bin was pushed around 235 miles across the factory floor each year (equivalent to travelling from Witney to Middlesbrough and taking 5.7 days in total). Adjusting the process saved valuable time – and shoe leather – and provided a 15 per cent increase in capacity. 10. 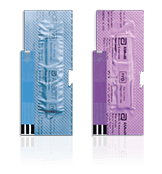 FreeStyle Optium blood glucose and blood ketone test strips are continually being tested on people as well as machines. Employees at Witney volunteer to take part in anonymous testing programmes run as clinical trials on site, diabetes clinics around the country also take part in surveillance clinical testing.